Tollers are a mixture of retrievers, spaniels and setters with a possible farm collie cross thrown in. The breed was perfected in Nova Scotia, Canada in the latter half of the 19th century where it was known as the Little River Duck Dog or the Yarmouth Toller. 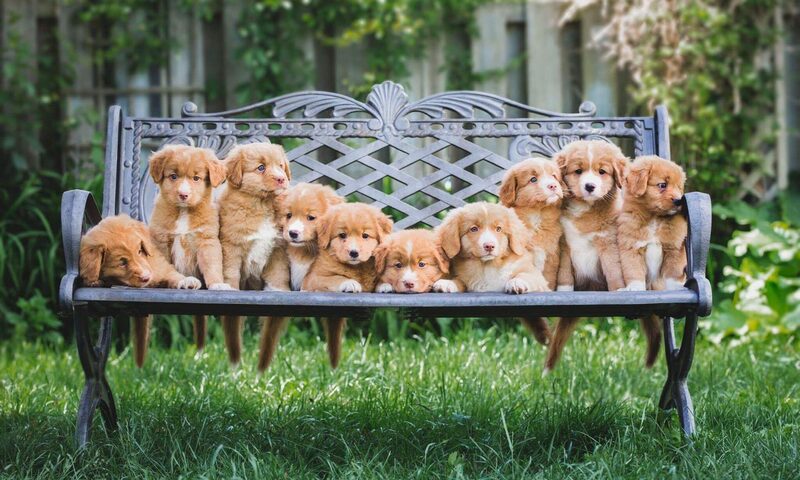 After many generations of pure breeding, it was recognized by The Canadian Kennel Club in 1945 and formally named the Nova Scotia Duck Tolling Retriever. which means to entice or pull. Tolling is a technique used to entice game such as ducks and geese to approach within firing range by arousing their curiosity. It’s a trick used by the fox and when hunters saw how well the on-shore antics worked, they developed a dog to do the same thing. Hunters in Nova Scotia were using dogs to toll ducks as early as the 1600’s. Highly intelligent and easy to train, the Toller has already made a name for itself in Obedience, Hunt, Agility, Scent Detection,Therapy and as Rescue Dogs. Their above average intelligence also means that they can be prone to very creative mischief if not exercised regularly. Tollers are average in their willingness to bark and may howl out of loneliness when their owners leave. When encountering something of great excitement, they will emit a “Toller Scream”. This scream is a very loud, frantic noise that has been described as the sound of a dog being fed through a woodchipper. While there are exceptions, most Tollers will only scream when they are behind a window and see something that they desperately want to chase. The most likely culprits to generate a scream are squirrels or birds. A dog of great endurance, the Toller is also a strong swimmer and a natural retriever, both on land and water. The breed likes to work and needs regular physical and mental exercise. How do these measures translate to your home? Well, conveniently, a Toller’s tail is not tall enough to not knock a glass off an average coffee table. The Toller wears a medium-length, water-repellent double coat with a softer, dense undercoat. The undercoat sheds seasonally. This breed requires brushing and the occasional grooming of ears and feet. Do they shed? Yes. Intact girls shed seasonally, but also based on their heat cycle. Intact males and Spayed/Neutered dogs shed seasonally. The coat of a spayed/neutered dog is thicker and longer than that of an intact dog! Tollers may be various shades of red with white markings on the chest and feet. White markings may also extend up the nose and on the tip of tail. The Toller survived two devastating outbreaks of canine distemper virus in 1908 and 1912, which resulted in a small population of dogs. While Toller was first accepted as a purebred by the Canadian Kennel Club in 1945, there were no Tollers were registered until 1959. In the next 5 years, only 9 Tollers in total were approved for registration with the CKC. All of today’s registered Tollers can trace their pedigree back to these 9 dogs.